Frameworks are a business-oriented grouping of items and are used to establish a link between related components. For example, all the components used to create the LANSA Personnel Demonstration application are in the Human Resources framework. Some generic frameworks such as Manufacturing and Executive Information are automatically defined in a partition and contain components typically needed in these kinds of applications. Frameworks can be created on IBM i and a Visual LANSA independent system. To access the Frameworks lists, from the Repository tab in the Editor, open the partition you wish to look at, select the Organizers list, then select Frameworks. 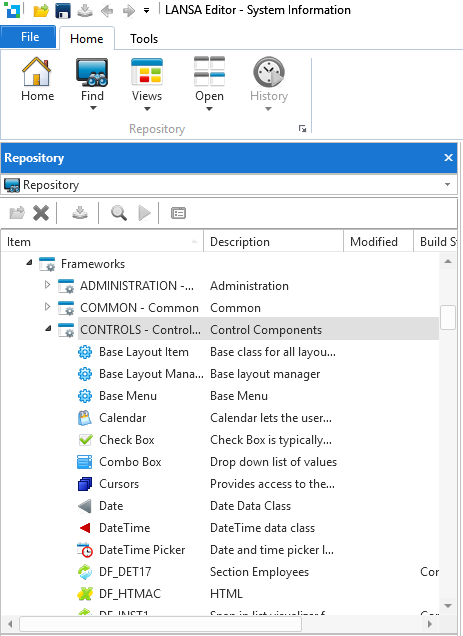 To create a Framework, open the Partition and then select Add from the context menu in the Framework tab. You can create your own frameworks. When you create a component you can specify the framework in which you want to store it. You can also change the framework in the editor using the Framework property of the component. You can view a list of objects in the repository using a framework name. Frameworks do no have any programming or development impact. Frameworks are simply a method of associating objects to assist developers in managing their development environment. There is no structural relationship between groups and frameworks, i.e. a group is not contained in a framework or owned by a framework.